If you’re looking for an alternative to the usual pasta dish, I’ve got a just the inspiration for you to try! 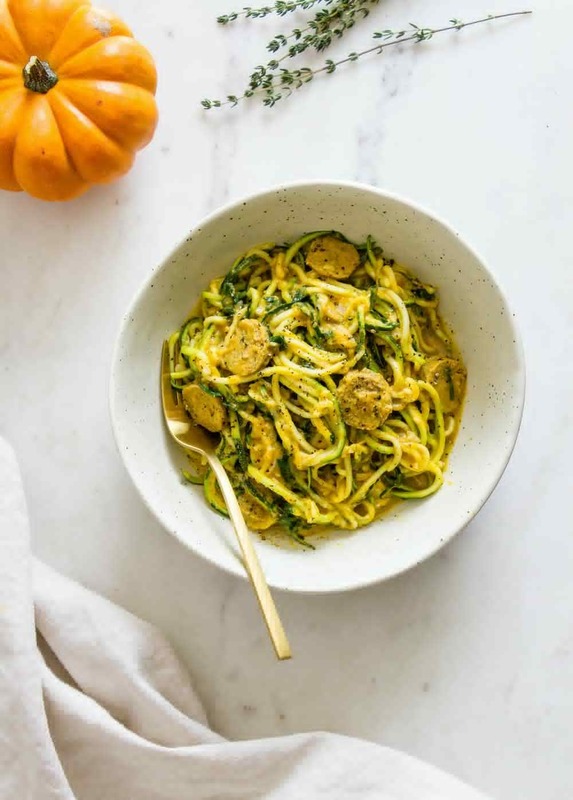 We’ll be making an easy, creamy pumpkin sauce, adding vegan sausage and kale, then tossing it with zucchini noodles for a delicious departure from the traditional spaghetti routine. It’s full of deliciousness and a perfect way to enjoy the season’s flavors! If you don’t care to make zucchini noodles, feel free to use 12 – 16 oz. of your favorite pasta. I originally planned on using either gnocchi, fettuccine or linguine, but ultimately decided to use zucchini noodles instead. Spiralized sweet potato noodles would be great too! 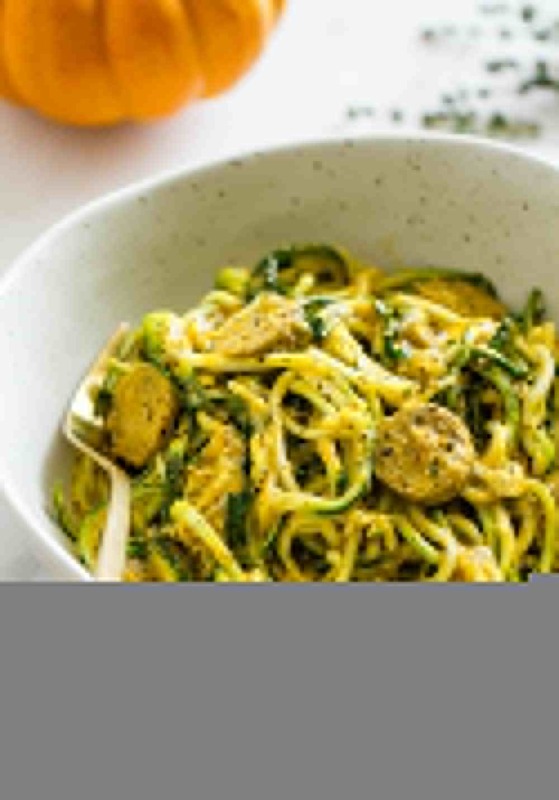 I’ve been trying to keep the carbohydrates to a minimum and zucchini noodles are a great healthy alternative. For the vegan sausage, if that doesn’t appeal to you try sauteing mushrooms instead, or omit it all together. The sausage does round out the nutritional profile, adding a good amount of protein. It also adds additional texture and flavor. We’ll be using thyme for the herb, but rosemary or sage would be just as good. Keep the optional herbs in mind for variation. The sauce is very simple, using pumpkin puree and non-dairy milk. It’s a creamy consistency that will wrap around the pasta making each bite full of flavor. Start with sauteing the shallot, garlic, sausage, kale and thyme. Add in the pumpkin mixture, then the noodles, and heat over low until warmed through. Simple and delicious, it’s an easy meal that will be ready and on the table in about 30 minutes! Switch up the usual pasta routine with this fall flavored pasta sauce. It’s flavorful and works with all types of noodles! In a medium size bowl, combine the milk and pumpkin puree, set aside. In a large pan, heat oil over medium, add shallot and saute for 4 minutes, add garlic, sausage, kale and thyme, cook until kale softens, stirring occasionally, about 3 – 4 minutes. Turn heat to medium-low, add the pumpkin mixture, and give a good stir. Add in the zucchini noodles, using tongs, mix to coat, place the cover askew and let simmer 4 – 5 minutes, or until zucchini has become al dente, stirring occasionally. If the sauce is bubbling too much, reduce heat to low. Taste for flavor adding salt & pepper to taste. Pairs great with a dusting of almond parmesan and slice of your favorite artisan bread. Spiralized sweet potato would be great here too! Use your favorite pasta. There’s enough sauce for about 12 – 16 oz. of pasta. Cook the pasta according to package directions and add it in the recipe in place of the zucchini. Easy peasy! If you have garlic and powder on hand, try adding a dash or two. It will ensure full flavor. Silk, plant powered and delicious! Sign up with Silk and get an instant member coupon! Find out where to buy Silk products in your local area. What’s your favorite vegan sausage? I love both Fieldroast and Tofurky. I just pretty much go with what I find at the store, but Fieldroast is my first choice. For this recipe, you can use a variety of flavored sausages, as well as plain. Pumpkin is available– but zucchini is not. We don’t all live in California. I hope you aren’t presenting this recipe as “original” as I was making this back in the 90″s. I suppose we are fortunate here in California, but any pasta will work on the off months. I was going to use regular pasta but didn’t want the heaviness and carbs. I’m so glad to have been exposed to the zucchini alternative. New to me, and I loved it! Thanks! What a snarky comment from Joanne. What’s original these days? Most recipes are spin offs or personal takes on previous recipes. I was also vegan in the 90s, living in San Franscico/Berkeley and I never came across this. People weren’t spiralizing zucchinis as they are now. 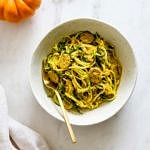 I would say that a pumpkin zuchini pasta was not a common dish in vegan cooking, not like a tofu scramble or a lentil loaf. So give me a break, with “I was making this back in the 90s”. Who cares!